Owen, Oliver and Harry are ready to shoot down stream. 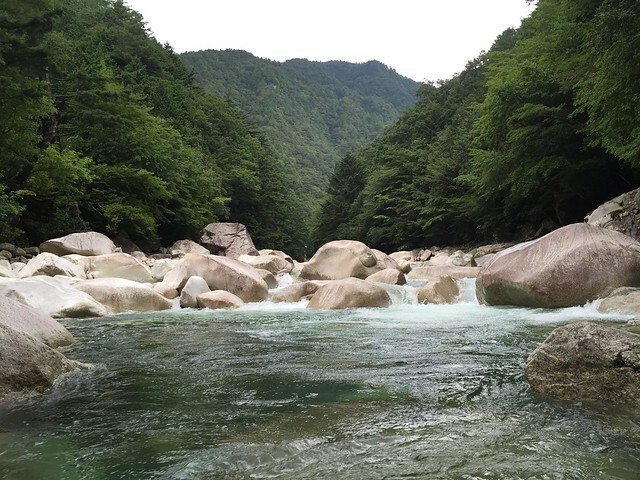 We had a fantastic day in the outdoors yesterday hiking/swimming up and down the Aichi River. We were quite sleepy as we drove north on the Meishin Expressway heading up to the Shiga prefecture early Saturday. Shiga is the state that surrounds Lake Biwa and we were headed to a river that feeds into the lake. We stopped at the dam before completing the journey to our entry point on the 421 highway. The best part of the day for me was watching the kids learning how to maneuver in the fast flowing river. Especially Oliver, who does not have a passion for swimming, get over his fear and by the end of the day, begging us to stay as we jumped into the current and let it carry him down river. I think he learned to give new experiences a try and with effort and courage, he can accomplish something he didn’t think was possible at first. An important lesson for him and hopefully he will carry into future challenges he will face. 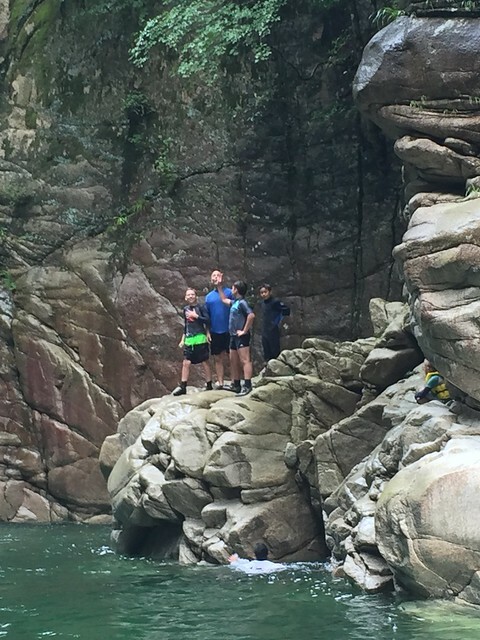 The hike up the river was hilarious. 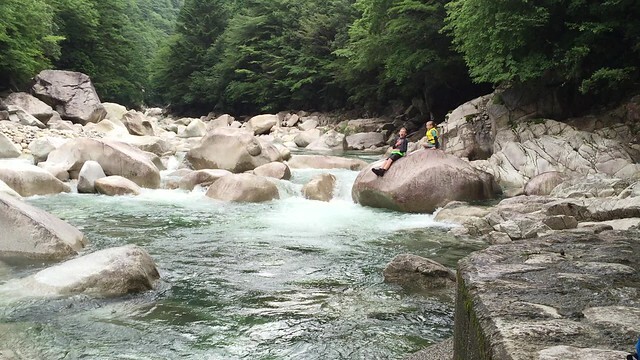 It was a non-technical scramble along the banks and over the big and small boulders in the river. 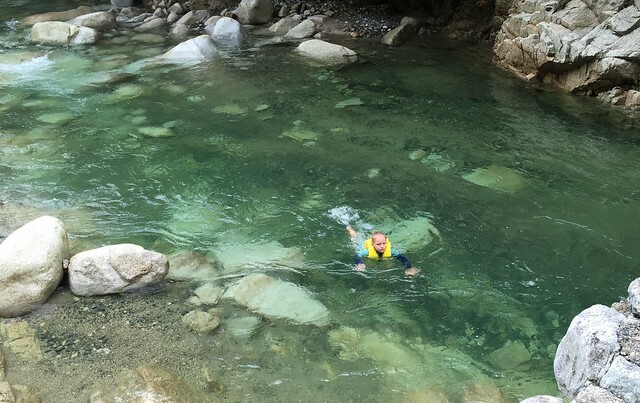 The water was very clear and the water was fast, but not dangerously fast. It sounded and looked more risky than it actually was. I couldn’t stop laughing seeing that my wife Nadia, a true city girl, was put in the middle of a white water rapids. Trying to get her over the rocks and to get into the river was funny. She got over her fears as well and she did remarkably well on the walk back down to our camping spot for the day. The scenery was spectacular as well. The walls of green foliage contrasted with the turquoise water and white rocks. We only saw a few people the whole day and it felt like we had the river to ourselves. It reminded me of Horserace Rapids in my home county in Michigan. 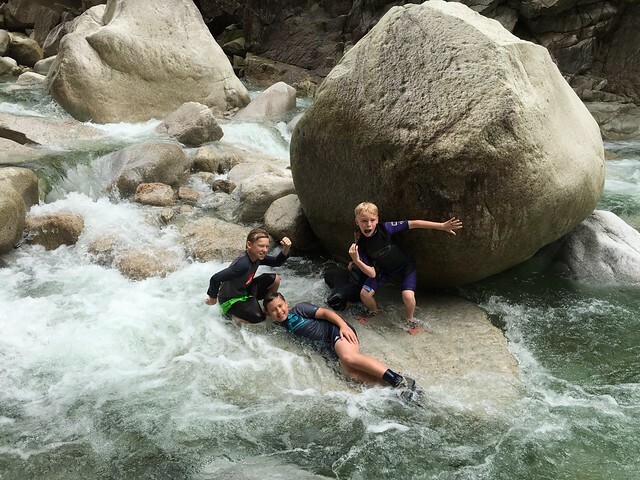 I am so glad my family got to experience a river like I used to.